Seeking Peace, Spiritual Escapism or Spiritual Responsibility? Is peace nothing more than the passive absence of conflict? Is it nothing more than relief and release from the stresses of physical life? If you look externally for peace, that may be the case. However, if you look internally, the reality may be altogether different. Our physical lives are fraught with ongoing change. Forms come into being, change, and disappear, while new forms arise. This constant flux of destruction and creation is the ever-shifting foundation of our physical lives. The view from such a strictly physical perspective emphasizes the absurdity of seeking peace. In this context seeking peace looks like nothing more than spiritual escapism. And in actual fact, many who earnestly follow religious or new age pursuits are indeed escapists. Some people find the density of physical life to be so uncomfortable they want to leave it and pass into airy realms untethered to the messy business of life on earth. Their ideal state is nothing more than the passive absence of conflict, a truly ungrounded desire for release. In our mentally driven culture, this could end the conversation about seeking peace. Logical slicing and dicing of the facts too often substitutes for the perspective of our integrated heart and mind, inevitably leading to flawed and incomplete conclusions. I recently read Peace Is Not the Answer by the self styled spiritual teacher and guru Andrew Cohen. While he makes a few statements with which I agree, he entirely misses the deeper potentials of seeking peace. From the mentally driven point of view, having easy access to all manner of physical consumer goods and relative freedom appears to eliminate any authentic need for seeking peace. Looking externally at the quest for peace in this manner leads away from the truth of the matter. Ken Wilbur, one of the leading systems thinkers of our time, takes the view that our consciousness has evolved through levels of existence. He traces the resulting pathological development of our societies in an extremely lucid fashion, showing how each pathology has lead to greater pathology at the next level. Having or not having access to consumer goods is clearly not the point. Distortions in development are far more significant. Humans need to clear as many of their own personal distortions as possible, but sooner or later run into group patterns of distortion that do not yield as readily. Seeking peace internally is the essence of the quest for undistorted existence. Cohen does concede that peace is intrinsic to the underlying ground of reality, but apparently sees little use for it other than as an experience of freedom in meditation. He derails into the idea that we are to be egoless and passionately involved with life. I have no problem with passionate involvement with life, but this assumption that the ego must be eliminated is more than a little questionable. Among others, Eckhart Tolle has been advocating the death of the ego, but if you pay attention, he narrowly defines the ego as the distorted manifestations only. He states there remains a need for boundaries. And I see the ego as the vehicle devised to maintain appropriate boundaries and identity on the physical level. The ego will serve best if cleared of distortions and then integrated in service to our inner connection with the divine, deeply grounded into our physical life on earth. This integration is not easily achieved. However, once we start working with the divine core of ourselves, all things transform. This does not mean external peace in the sense of sudden absence of conflict or relief from the stresses of life. Instead it provides an altogether different way of working with physical form. Without conscious centering in the inner core of peace, life is frequently experienced as chaotic and negatively distorted. Working from the inner core of peace, we can deliberately infuse the ever-changing forms of our physical lives with the qualities of peace, love and joy instead of fear and further distortions. This is not a small matter. A profound experience of inner peace provides the means to create a higher level of physical existence itself, all in the face of the simultaneous destruction and creation of forms that remains the hallmark of physical existence. 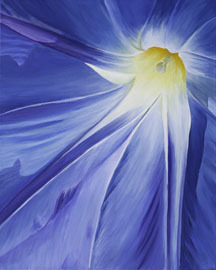 Glory is a painting by Lexi Sundell and has been sold. Prints are available from the fine art gallery, RiverStone Gallery. This entry was posted in Essence and Form and tagged divine, ego, mentally driven, painting, peace, spiritual on April 9, 2008 by Lexi Sundell. Isn’t the universe an incredible playground? When we seek affirmation for a thought process, an answer always seems to follow shortly thereafter. My fundamental belief is that harmony is equivalent to mediocrity. I have to agree with you on your insights into the quest for peace. Even though I believe that we are not here to essentially to learn, I do believe that we need disruption n our physical lives, in order that we may create platforms from which to grow. The old saying, “you can’t experience the highs without experiencing the lows, and vice versa”, really applies here. The theory of true empathy, I believe, applies her as well; how can you feel someone else’s pain or pleasure, without having experienced it yourself. We are, for all intents and purposes, intensely physical beings – by pure virtue of the fact that we have chosen this “physical realm” in order that we may experience stimuli on a physical level; and the physical experiences primarily through physical or mental external influences. Even though I am not advocating that people who create “more drama” in their lives are more spiritual, I tend to find that entities that challenge barriers (who I’m sure are seen to be the quintessential “drama queens”, and not to seek attention) are the ones who require a physical “kick start” so that they may create an action, which causes the reaction, and therefore, the obligatory experience. I believe that these “upheavals” that we make our reality, are the very same processes which allow us the opportunity to gain empirical knowledge (insight through experience) and allow us to become who we are meant t be. I’m sure that the people, who cause the disturbances in their lives, are the ones that believe that there is another “dimension” or appropriate power, outside of their physical existence. The reason I say, at the beginning of my post, that affirmation is always realised, is that this subject has been at the forefront of my mind for quite a while now, and most ‘spiritually-inclined’ people I speak to are unyielding in their belief that, “the meaning of spirituality is striving to achieve a harmonious state, or peace, on Earth”. So, thank you so much for facilitating this predication for me. It always helps to know there is substance to your thoughts.